Categories: African American Studies, Asian American Studies, race and multiculturalism. Elaine H. Kim, Susan Roberta Katz, and Anthony M. Platt, eds. 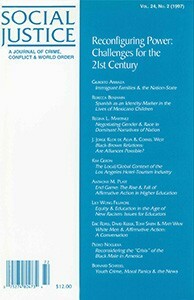 This issue appears as the momentous changes of the last 20 years–the decline of the civil rights coalition, the demise of mass movements for social justice, the rise of New Right and neoliberal politics, the dramatically changing demographics of the country, and divisions among various “racial” constituencies–greatly challenge the development of a vision and strategy for achieving social justice. The issue takes modest steps toward addressing how we might begin to forge new alliances in the post-civil rights era. Most essays call for a much more complex understanding of race relations and a need to transcend one-dimensional causality and single-issue politics. They also highlight the need to give much more prominence to the relationship between language, cultural identity, and citizenship.